New York Times news headline and story of creamy white mug/stein with gold trim, 4 3/4" tall, no problems, Excellent vintage condition. 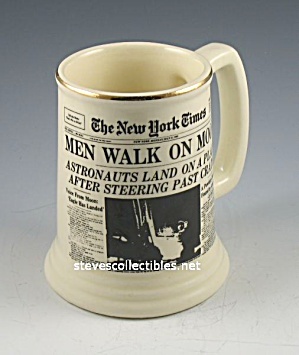 Times headline is "Men Walk on Moon" and other text headlines relating to landing are readable as well. 1969 Bottom is marked: Sir-Amic A Sterling Ceramic By Silver, Ben Silver Inc, New York in gold as well as pottery maed on bottom C713 Made in USA.